For anyone suffering from problems like wrinkles, folds or depressions, dermal fillers may be the perfect solution. The procedure is quick, often just 30 minutes or less, with many people experiencing no pain at all and minimum side effects. Dermal fillers offer an affordable and highly effective way to address the effects of aging. Minimal, non-surgical injections will reduce nose to mouth lines and add youthful volume to lips, cheeks, chins and décolletage. 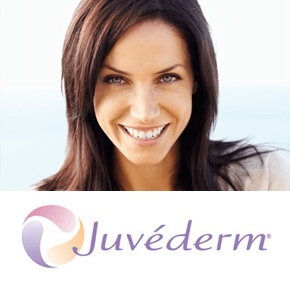 Juvederm® is a brand name for the leading dermal filler on the market today. The main component of Juvederm® is Hyaluronic Acid, a naturally occurring substance in human skin that helps repair damaged tissue. It can also bind with collagen, which is the material that supports facial skin, in a way that allows more natural nutrients to flow to the skin. While hyaluronic acid is naturally a liquid, Juvederm® is chemically altered to produce a gel. This means it lasts considerably longer before being metabolized by the body. Juvederm® is suitable for most people with unwanted wrinkles. It may be particularly suitable and effective for people looking to combat the signs of ageing or dealing with the effects of excessive exposure to UV rays. Why do we use Juvederm®? Juvederm has all but replaced collagen as a dermal filler. It is smoother than collagen making it much easier to shape and sculpt with. Lumpiness and irregular contours are much less likely with Juvederm. Juvederm also lasts more than three times as long as collagen. Compared with Restylane, the other major brand of dermal filler, Juvederm® is softer and feels more natural. Most patients who have had both prefer Juvederm® and say that it feels softer and more natural. Juvederm® is also FDA-approved to last up to one year – about twice as long as Restylane. For most of us, smile lines - also known as nasolabial folds - are nothing to smile about. These lines and creases run from the side of the nose to the corner of the mouth, and are the result of the loss of facial volume and skin elasticity as we age. They can make you look older, tired, or unhappy - even though you feel youthful inside. Juvederm® is designed to soften these lines by re-establishing the facial volume in these regions, resulting in a more youthful appearance instantly. Lips are a multi- functional organ. As well as for eating and drinking, we use them to communicate our emotions, both verbally and non-verbally, from a very young age. The rich supply of nerve endings in the lips also enables them to serve as a tactile sensory organ and erogenous zone. The lips also have a strong influence on the aesthetic quality of the face. Along with large eyes, a small nose and delicate features, full lips are traditionally regarded as typically female facial traits and thought to be linked to high levels of oestrogen. As with all other areas of the face, the lips are not immune to the effect of ageing. Fine rhytides appear in the upper lip, creating a smudged appearance between the lip edge and the surrounding skin. The philtrum and Cupid's bow lose definition and the lips become inverted. Options for aesthetic enhancement include augmenting the philtrum, increasing lip height, re-shaping the Cupid's bow and improving the lip contours, all of which can be achieved with dermal filler. However, dissatisfaction with lip shape or size is not necessarily associated with ageing. Increasingly, younger women are looking to enhance their appearance with lip augmentation. One of the biggest problems with lip treatments today is that they have the potential to make lips look unnatural. We've all seen the 'trout pout' and the over-augmented 'rubber tyre' look. A good treatment should always ensure that the lips are in harmony, balance and proportion with the overall size and shape of the face. Dermal fillers can also be used to improve the appearance of your nose as an alternative to surgical procedures such as rhinoplasty. Nasal contouring procedures with dermal fillers should actually refine, rather than change, the nasal anatomy. Many people are concerned by nasal asymmetry. We inject tiny amounts of gels in areas mapped to correct any asymmetry. Most nasolabial folds will typically require two syringes to fully correct. One syringe of Juvederm is sometimes sufficient for mild nasolabial folds. For lip augmentation, one syringe will sculpt and enhance the lips. The change will be noticeable but subtle. Two syringes will give a more dramatic size increase and enhancement. As we age, our lips slowly lose volume. Women who have noticed this and want to restore lost volume will usually need two syringes of Juvederm. Fortunately, the composition of Juvederm® means it is much smoother to inject into the skin than some similar products. There is likely to be some pain and tenderness during the treatment, though this is generally mild and will usually be dealt with by a local anaesthetic. After the treatment, it is possible there will be some short term swelling or bruising. When this does happen, it generally fades away within a week. Juvederm® is not suitable for people with severe allergies or anaphalyxis. A full Smilemakers' Medical History will be taken before any clinical procedures are conducted. As with any other medical procedure, Juvederm® is only safe when carried out by qualified professional following established practice.